Suzie and Jeremy booked me through a friend living in Villars-sur-Ollon to photograph their elopement castle wedding in Switzerland. After being together as a couple for a long time they wanted an intimate wedding with just a couple of close friends and their little boy. We set out to capture the beauty of the castle, mountains and vineyards as well as their wonderful ceremony. To make the most of the day they wanted to create an album to share with their friends and family back home in the UK, especially so that no one felt as if they had missed the occasion. It was so much fun to be a part of this special moment without all the chaos of a big wedding, we were free to be spontaneous and make the most of the location. Once upon a time a couple who were deeply in love decided they wanted a small, intimate wedding. They had a wonderful friend who suggested a fairy tale castle in a sea of vineyards in the Swiss Alps. They booked flights, dealt with the paper work and eventually on a sunny Friday afternoon, the fairy tale came true. Suzie got ready in the gorgeous alpine spa Les Mazots in Villars-sur-Ollon with her bridesmaid Katie. We took plenty of time to shoot some stunning portraits of her and her bridesmaid Katie putting on their makeup, getting into the dress and enjoying a glass of champagne with a mountain view. 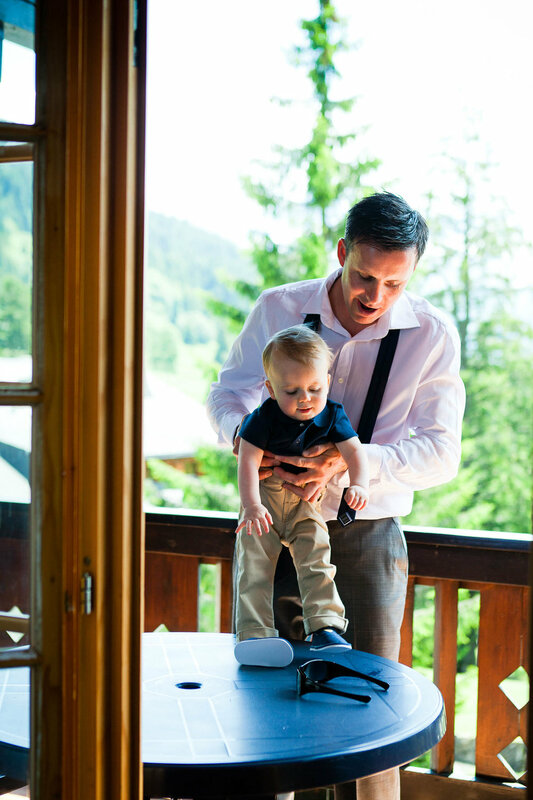 Afterwards I headed to La Résidence where the boys were getting ready with little Harry being dressed by dad and a more definite air of nervousness. The civil ceremony took place at the Chateau d’Aigle with just the officiant, Suzie, Jez, their little boy Harry and witnesses Katie and Charlie. We arranged a first look with a nervous groom before they headed in for the exchanging of vows. It was an emotional moment, lightened by Jez punching the air as the formalities ended! After the ceremony we leisurely exploring the castle and vineyards taking photos wherever looked fun. I especially love the small group photos in the courtyard, in perfect light they capture the bond between these great friends. 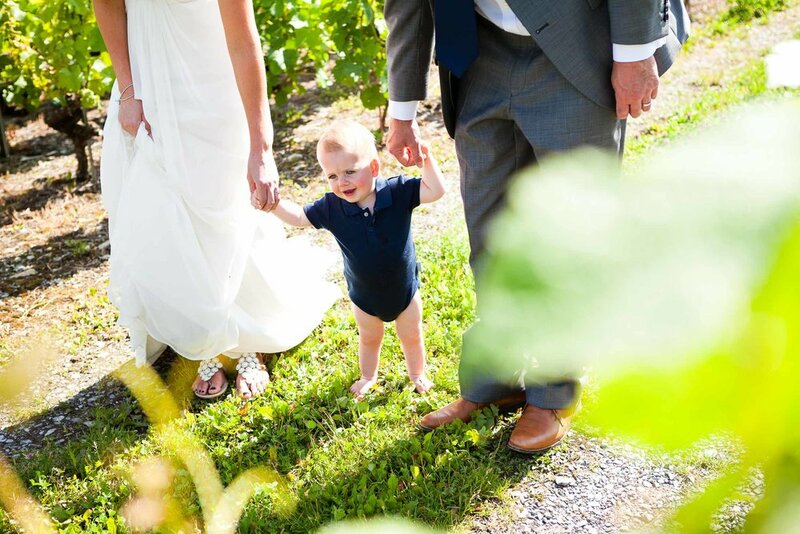 We cajoled Harry into a few family pictures before Katie improvised some first dance music for the happy couple. The resulting images are among my favourite from the day, with both Jez and Suzie looking so happy and carefree. 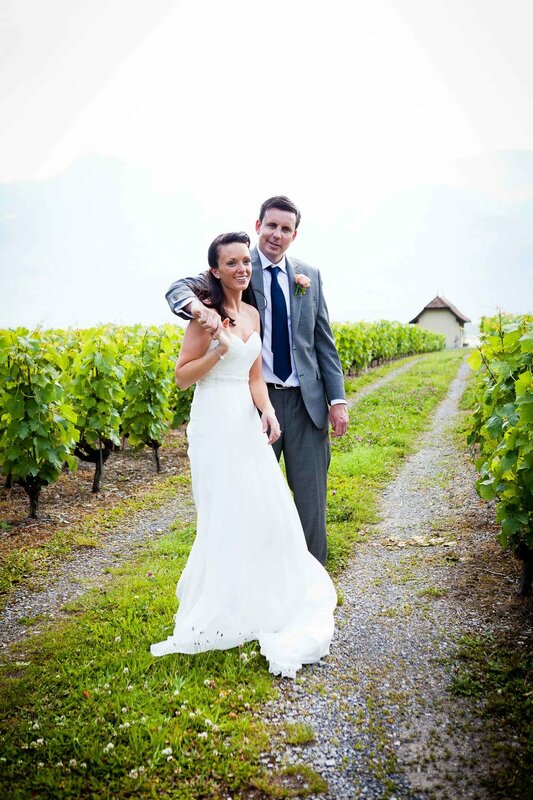 Suzie and Jeremy chose a bespoke wedding photography collection for their small wedding at the Château d’Aigle. The coverage included bride and groom preparations, the ceremony and relaxed couple, group and family pictures in the vineyards around the castle afterwards. To remember their special day they chose a Storybook album with a personalized design and high resolution files to download from their own online gallery. For a bespoke wedding collection to fit your needs, please get in touch for a personalised collection. I offer a single wedding collection with everything you need as well as à la carte pricing for your wedding photography in Switzerland or abroad. Choose from multiple days and locations, add high or full resolution downloads, cards and a wedding album selection with something for all styles.